Writer Laura Stevenson started spending her summers in Vermont when she was 5 years old. Her experiences in the town of Wilmington, as well as the hearing loss she suffered in her late twenties, are fodder for her novels. Stevenson started spending her summers in Vermont when she was 5 years old. At the time her family had bought an old farmhouse as a second home in Wilmington. "If I could really tell you how I felt about Vermont, I wouldn’t have to write books. I write books to figure it out," she says during an interview in her home. Her most recent book is Liar From Vermont, whose protagonist Peggy spends her summers in Vermont and then returns to Michigan in the fall, just like Laura Stevenson. And like the author, Peggy rides a horse around the countryside and loses her mother when she is a teenager. "When you write something that’s autobiographical, if it’s going to be authentic – even if it isn’t true – you have to re-experience the emotions," says Stevenson. "There were parts of Liar From Vermont that took me weeks to work through." In the novel, Peggy sees more and more farms replaced by second homes. When Stevenson first came to Wilmington, there were four homes on the road where her family’s farmhouse is located. But now there are 22. "That’s a change in real estate on the scale of what happened when the settlers drove out the Indians," she says. "It’s an immense change!" The changing Vermont landscape is also a theme in Stevenson’s novel, Return In Kind, which features a college professor named Eleanor who loses her hearing and resorts to cleaning houses to support herself. This is a trauma Laura Stevenson knows first hand. The author started going deaf when she was 29. She says it was terrifying. In 1983, Stevenson quit a college teaching job in Massachusetts and retreated to the family home in Wilmington. She was 35 at the time and a single mother to boot. Despite her PhD in Elizabethan history, Stevenson had to resort to cleaning the weekend homes of out-of-state skiers to make ends meet. 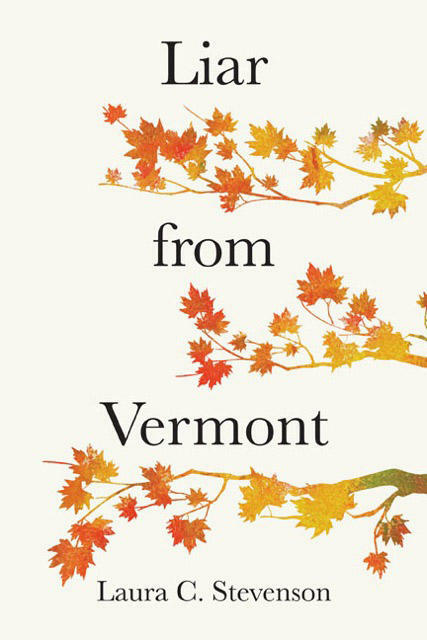 In Stevenson's most recent book, the protagonist Peggy spends her summers in Vermont and then returns to Michigan in the fall, just like Stevenson herself. "It made me feel ashamed," Steven says when asked what the experience was like. "Not of cleaning houses, but of not having really been aware of all those other people who had to clean houses. And I learned some very interesting social things. There were plenty of guys who wouldn’t even glance at Professor Stevenson but who will make a pass at the cleaning lady. And I hadn’t realized that was true until I realized that was something I was going to have to deal with." In 1986, Stevenson was hired to teach writing at Marlboro College. The school paid for typists and court reporters to transcribe faculty meetings and classroom discussions so that Stevenson could fulfill her duties and participate in the academic community. John Sheehy, a professor of writing and literature at Marlboro, worked closely with Stevenson. "Deafness makes some people uncomfortable. Some people among her colleagues had trouble communicating with Laura and that really frustrated her," he recalls. "She told me once, 'When you’re deaf, it’s easy to disappear. And the only way you’re not going to is you just have to put it out there.' And she got her idea on the table. She was not going to disappear." Despite her deafness, Stevenson had little difficulty communicating with her students, who type on a wireless keyboard that displayed text on her laptop screen. The process slowed down conversations but had an unexpectedly helpful educational effect. It turned out that the ability to go back and review their exchange helped students reflect, Stephenson says. This dynamic is at play in Stevenson’s novel, Return in Kind, where the deaf protagonist Eleanor asks a man to communicate by writing on a pad of paper. Stevenson is finishing another novel, a murder mystery set in England, and she already has an idea for her next book. "The next one, which is waking me up at night, is going to be back in Vermont," she says. "Which is where I think I belong." As 2015 draws to a close, we've taken a look through our archives for the sound that best captures some of events that unfolded this year. A new film featuring the Green Mountain State is about a young married couple who decides to move to Vermont to find their more “authentic” selves and work on their troubled marriage. It's Us explores the idea of a "geographic fix" – that moving to a bucolic state with its beautiful pastoral landscapes and mountain air can help resolve an existential crisis. But ... can it? It's hard to imagine a worse disease than amyotrophic lateral sclerosis, or ALS. The muscle-wasting affliction strikes about 5,600 patients each year. Thirty thousand people are living with it in the United States. The vast majority of those cases are not inherited. But for families that do carry the gene, it is especially heartbreaking. One of those families lives in Vermont, and they are helping to advance medical research.